A delicious salad full of fresh vegetables and topped with buffalo shrimp. 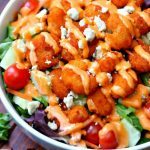 If you love all buffalo shrimp, you’re going to love this Buffalo Shrimp Salad! Cook popcorn shrimp according to directions on box. Drizzle buffalo sauce over buffalo shrimp and stir until shrimp is evenly coated. Place salad greens and vegetables in bowls. Spoon buffalo shrimp over salad. Top with blue cheese crumbles. Mix buffalo sauce with salad dressing.